This past Sunday afternoon I attended the closing service of Northwestern United Church in the Champlain Park neighbourhood. I felt it was important to do so, both from the perspective of changing history (to say goodbye to a long-time neighbourhood institution), but also because the Church had been important to my family for many years. My grandparents lived on Western Avenue, just a thirty second walk from the Church, and attended the Church faithfully from its opening until my grandfather’s health in the late 1990s would no longer allow it. Reverend Jenni Leslie's final sermon in the Church on Sunday indeed focused on the very theme of family, and how important the Church had been to so many families in the community for so long. Northwestern was a bit of a unique institution in that it was built intentionally small, constructed to directly serve the local neighbourhood, establishing its own small community, its own family, from day one. I think that was what made it as special as it obviously was to its long-time members - that the congregation was tight-knit, the focal point of many community activities, based within a place of worship that was modern yet still traditional in many ways, but with a forward-thinking blending of style. We’ve all seen the decline of churches in most cities and communities, and especially in Kitchissippi over the last few years. It’s unfortunate that a neat little community church like Northwestern was no longer able to survive on its own. So I feel privileged to have been able to participate in the final service at the Church this past weekend, and while sitting there on Sunday, I felt it would be interesting to tell the story of the Church. The congregation lives on in the merged Kitchissippi United Church on Island Park Drive (formerly the Kingsway Church), but it’s always sad to leave a building behind, to see it's usage change or worse, to see it demolished. While I believe the building is slated to remain for the foreseeable future (it has been sold to the owners of the Mosque property next door), it will not be the same. Those uniquely recognizable letters spelling out the Church’s name out front will disappear, the tall, thin steeple may come down, even the ornate stone work spanning the front entranceway and the distinctive stained glass windows may disappear, and perhaps even some of the less decorative features but which are so familiar to many, such as the old side door that led to the downstairs hall which has hosted so many community and family events over the years. While the building itself just is barely fifty years old, the history of Northwestern United Church actually can be traced all the way back to the early 1870s. Western United Church was founded in 1872, when it began as a Sunday School organized in the old west end public school at the corner of Somerset and Preston Streets. In 1873, Rev. Robert Mark, was appointed by the Methodists to take charge of their work in the western part of Ottawa. Soon after, the Temperance Hall, overtop a store opposite the Pump House by Pooley’s Bridge in Lebreton Flats was acquired, where Sunday School continued, and within four months had grown to 185 students. Steps were then taken towards the erection of a church. The cornerstone was laid in October of 1873, with Mrs. John Rochester performing the ceremony, and Lady Macdonald, wife of Sir John A. in attendance. The Ottawa West Methodist Church (as it was first known until 1925) was a large brick Church built at 545 Wellington Street, just a little west of Bronson Avenue (this spot is now vacant, but if you were driving west down Albert Street with Nannygoat Hill on your left, along where the Transitway now runs, you would see it on your right). The Episcopal Methodist Church at Queen and Bridge Street later united with Western in 1883, while two other churches grew out of the congregation as local suburb neighbourhoods began to grow: Bell Street in 1890 and Rosemount in 1893 (which later became Parkdale United Church). The impressive Western Church survived the Great Ottawa-Hull Fire of 1900 (where the story goes that the minister "paced the sidewalk outside the church in fervent prayer for the safety of the building"), and another major fire in 1903, and continued on through the years until the NCC decided to overhaul central Ottawa in the 1960s. 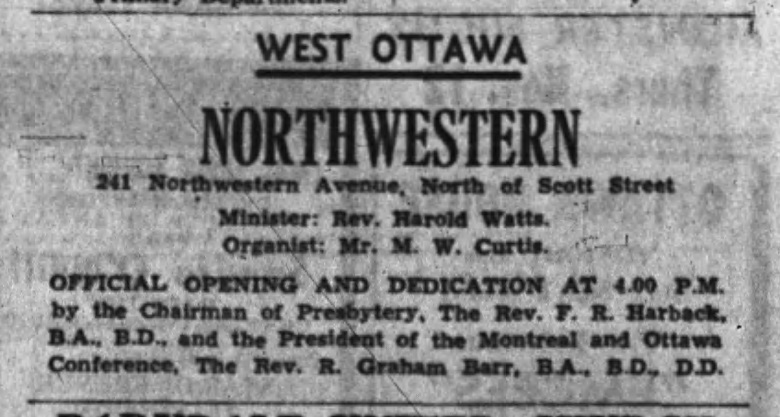 Equally, if not more important to the birth of Northwestern Church was the establishment of Ottawa West United Church in 1907, on a parcel of land donated by the Cowley family. That church name may not strike a bell for many readers, but I'm certain most would recognize the building. It still exists today, under a completely different name, tucked within the streets of Wellington Village at the corner of Spencer and Carleton. Ottawa West Church (named directly for the subdivision created by Cowley ten years earlier called "Ottawa West") began life as a Sunday School Mission sponsored by the Bethany Presbyterian Church (then located on Rosemount). It's first Minister was one of the west end's most beloved citizens of the early part of the century the Rev. Robert Eadie. It became the Ottawa West United Church after the union of Methodist and Presbyterian Churches in 1925. 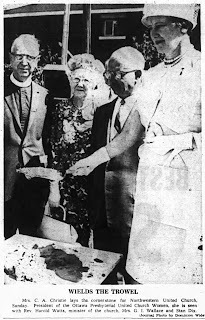 In 1937 for it's 30th anniversary, a special celebration was held, with the reading of a historical sketch, and most interestingly, the original mortgage was burned, freshly paid off, with Herb Groh “applying the torch”. The event also included a dedication service for the new Sunday School hall, called Eadie Memorial Hall, dedicated to the memory of Rev. Eadie. 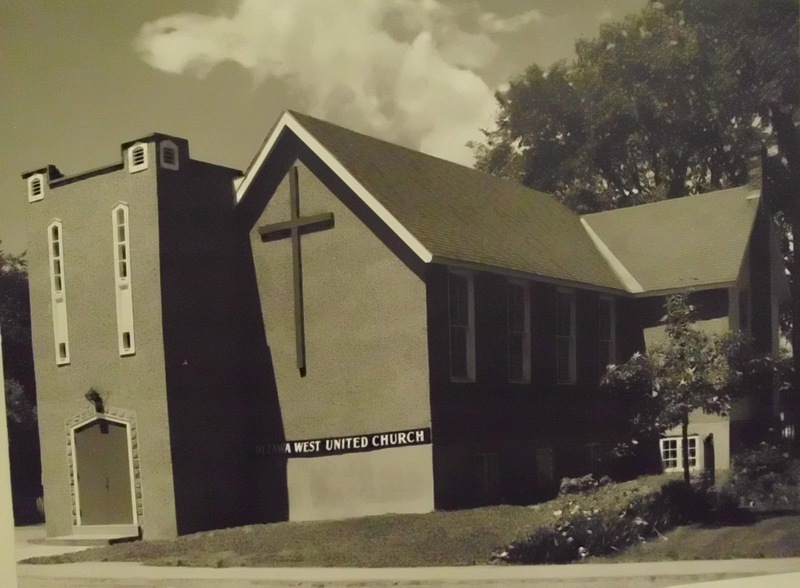 During 1949 to 1957, Ottawa West became associated with Woodroffe United Church, after which Rev. J. Macaskill took charge of the congregation. One funny memory of this Church was that a sound system was installed in 1960, and the sounds of chimes were played off vinyl records, and through the speakers located in the bell tower. It was in 1963 that significant events began to occur. 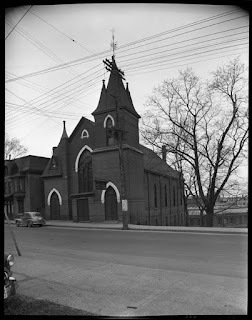 Early in the year, it was announced that Western United Church, at that time the oldest Methodist building in Ottawa, like most of LeBreton Flats, would be expropriated by the NCC and demolished. Additionally, it appears the congregation began to outgrow the Ottawa West church, which had already been expanded twice. 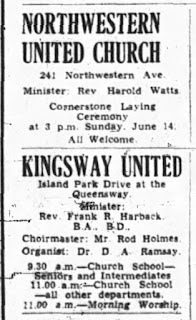 So, in May of 1963, the Ottawa Presbytery of the United Church of Canada approved the merger of Western United Church and Ottawa West United Church as of July 1st. It was determined that a new church would be needed, and required with little delay, as the church directors were nervous at the risk of losing portions of their congregations to the nearby Parkdale and Kingsway Churches. A large piece of land on Northwestern Avenue was acquired that fall, on which stood a few old wood-framed cottage homes (which were immediately demolished). The new name chosen was simply 'Northwestern United Church'. 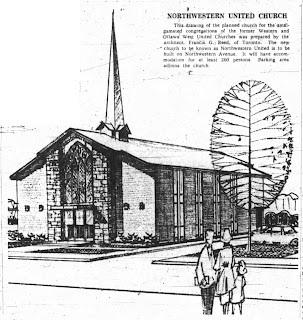 The first instance of the Northwestern United Church name being used was in January of 1964, when one of the key groups within the Church was formed, the Northwestern United Church Women, a popular, and well-run organization during it's peak years. Mrs. G. I. Wallace was named the first President of the NUCW. 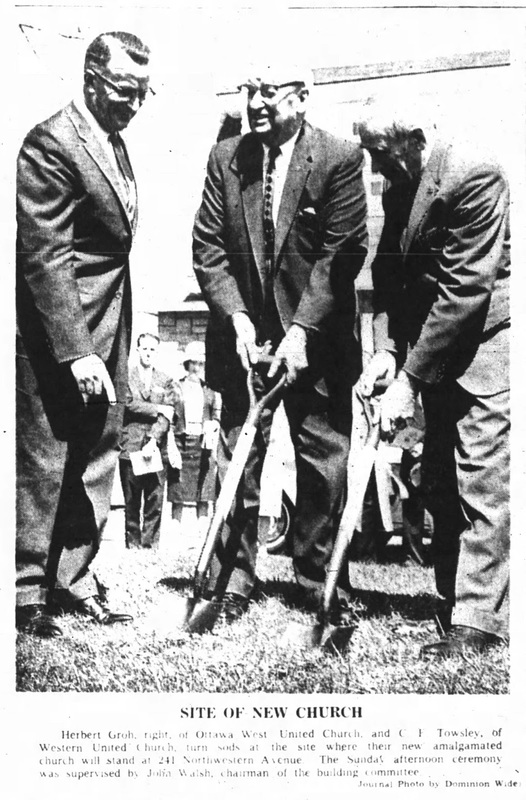 A sod-turning ceremony was held on Sunday April 26th, symbolizing what the Journal called the “marriage” of the two United Church congregations. Long-time Church members were chosen from each Church to represent them in the ceremony: Herb Groh from Ottawa West (member since 1924) and C. F. Towsley from Western (member since 1908) turned the sod at the exact location where the altar would stand on completion. Construction work began on Tuesday April 28th, with the contracting company the Shore and Horwitz Construction Company doing the work. Lead engineer on the project was Stan Dix. On Sunday June 14th, the cornerstone was laid at a ceremony at 3 p.m, by Mrs. C.A. Christie, president of the Ottawa Presbyterial United Church Women. Following the ceremony, those present attended a tea at the home of Douglas Sprott. inviting residents to attend the cornerstone ceremony. By June 20th, it was reported that the walls were going up on the Church. Meanwhile, on June 28th, the final service was held at Western United, led by Rev. Harold Watts, who noted that “God’s church is more than brick and mortar…the hearts of faithful men and women made up the church”. Over 300 attended this event. Following the service, three memorial windows (the large stained glass window above the front entranceway and two smaller windows placed in the chancel), the organ and pulpit were salvaged from Western United and incorporated into Northwestern Church. (The rest of the Church was demolished by summer's end). The original cornerstone from Western United Church and a memorial stone for Ottawa West Church were reputedly later built in to the front entrance of Northwestern. The congregation of Western United jammed the tiny Ottawa West Church on Spencer for July August, prior to the new church on Northwestern being ready. Towards the end of August, the Church neared completion. Signalling how close completion was, a classified ad appeared in the newspapers, seeking an organist and choir director. 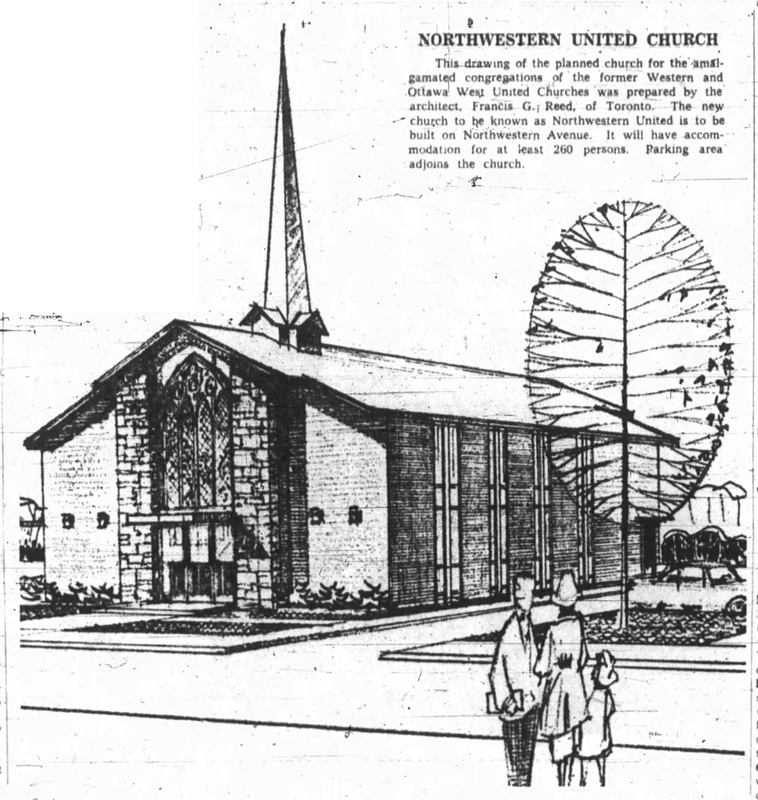 The first service at Northwestern was held on September 13th, 1964, with the official opening held a little later. 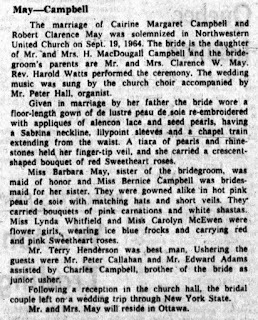 Less than a week after the first service, the first wedding was held in the Church. 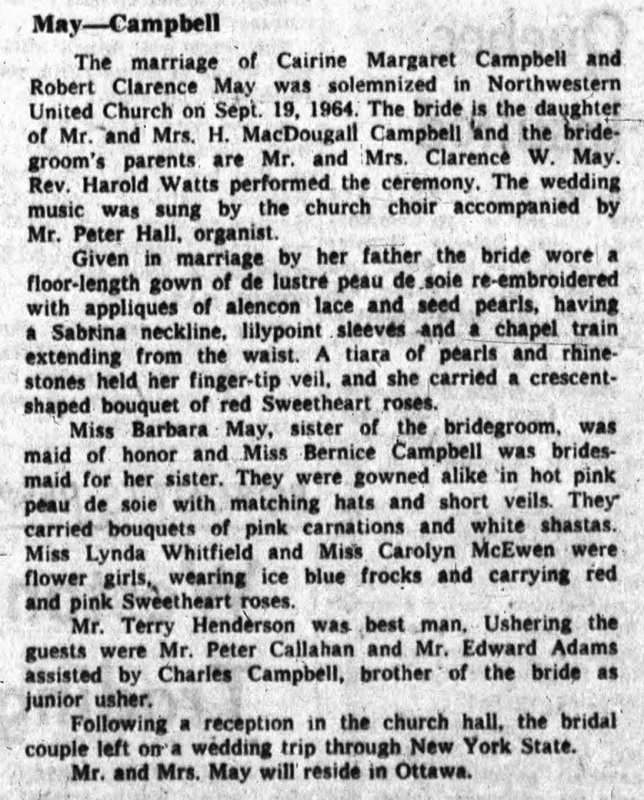 On September 19th, 1964, Cairine Margaret Campbell married Robert Clarence May at 3 p.m. The official opening and dedication took place at 4 p.m. on Sunday October 18th, 1964. Officiating at the service were Rev. F. R. Harback, chairman of the Ottawa Presbytery of the United Church, and Rev. R. Graham Barr, president of the Montreal and Ottawa conference. By the fall, the Church was in full community use. The Ottawa West hockey registration was held at the Church in November, one of the first community events held there! Meanwhile the former Ottawa West Church at Spencer was sold to the Seventh Day Adventist Church, and as mentioned above, still exists today as the Church of the Annunciation of the Blessed Virgin Mary. 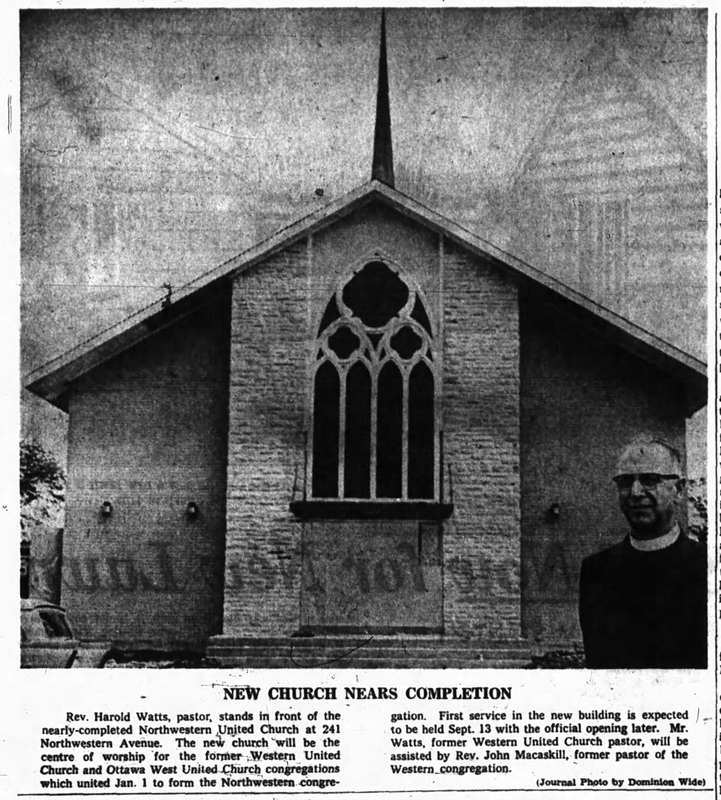 A permit was taken out in May of 1965 to build a Church-owned residence next door, at a cost of $19,500. It was built by J. F. Chieman, and still stands today. It is also worth noting that from its earliest days, Northwestern Church was welcoming to those groups in need. 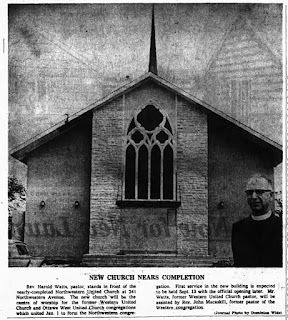 Not long after construction, the Church began renting the basement hall to the Ottawa Muslim Association for prayer meetings for ninety minutes every Sunday. The association had 500 members by 1965, and were actively raising funds to construct a community mosque. In 1967, they acquired the neighbouring half-acre lot on which at the time featured two old houses. The Association used one for prayer services, and had tenants in the other, while they awaited fundraising to progress further (construction of the Mosque would later begin in September of 1973). Life at Northwestern continued on through to the end of the century, but by the early 2000s, it became evident that three churches in close proximity in the neighbourhood could no longer survive. Members of the Kingsway, Northwestern and Westboro United Churches began to meet to discuss options. 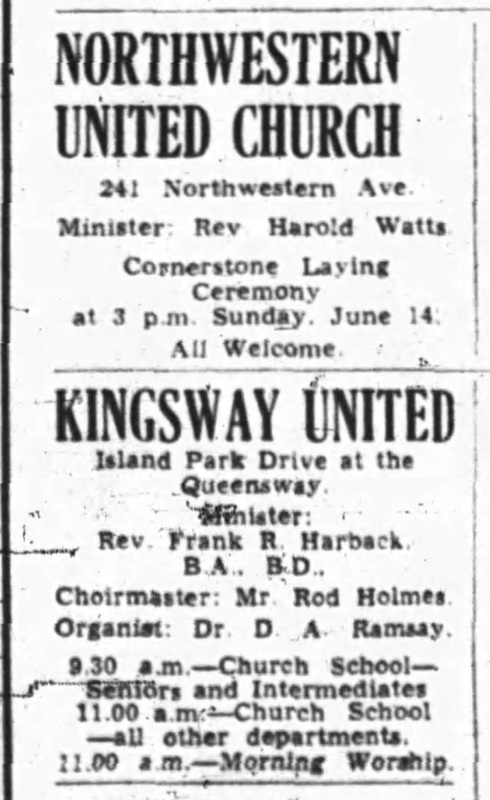 An amalgamation was decided upon, with all three congregations moving to the Kingsway Church on Island Park Drive, just south of the Queensway underpass. On October 5th, 2008, Kitchissippi United Church held its inaugural service. Northwestern United Church was an important part of many local residents lives for so long, and the process of the Church closing I'm sure has been a sad one for many. Best wishes to all who have been involved for so many years, in particular the Sprott and Reid families who have invested so much of themselves into the Church, and Rev. Brian Cornelius who attended with great care to my grandparents Aubrey and Ina Allston, during my grandfather's illness and passing, and later my grandmother's as well. I live just up the road on Carleton. But years ago I was friends with the pastor's son - last name of Eisner I think. It was very interesting to see that the Muslim community has had a presence in the community for so long. I remember a very upset woman going door to door with a petition to prevent the Mosque from building onsite parking. She was a bit nonplussed when I mentioned that St Peter's Lutheran on Sparks had just done that very thing. I was wondering if you can help me. 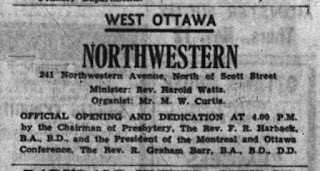 I have found reference to Rev Matthew Bailie conducting the services in Northwestern United Church and wondered if you know anything about him? I have a friend researching Presbyterianism in Ireland and we are wondering if this Rev Bailie is the minister of the same name who left Northern Ireland in 1950/60s and went to Canada.